No full review, as I didn't do it for the previous ones.Good for kids, but I feel Watson is starting to run out of steam/ideas. Things got silly in places - sillier than you would expect from her caliper of middle grade.I do love how her characters have reappeared from Jedi Apprentice and Jedi Quest. In keeping with Jude Watson's previous writing, Last of the Jedi #7 does an excellent job of moving the pace ahead and keeping suspense alive. The highlights of the overall plot included finding a new Jedi (familiar to readers of the Apprentice and Quest series), a return to Ferus' home planet, and the broadening of Ferus' latent Jedi abilities.I was pleased to see a character list at the beginning of this book. Even if this were an adult series, the number of secondary and tertiary characters is becoming difficult to track. Ferus' inability to discover Vader's true identity is maddening, but necessary... the question only remains of how this crisis will play out, with Ferus never knowing the secret or learning it but unable to pass it on (probably dying). Again, as with the others of this and Watson's other series, it is age appropriate for grade schoolers and still fun for all SW fans to pick up yet a little more Expanded Universe knowledge. I am still nervous because I have all of these theories of how the last books are going to go down and I don't know how I feel.Again - this is a middle grade book. I should not be this nervous...Recommended 9+ for Star Wars violence. There are some pretty cool parts in this book, including its ties to the Death Star, a scene with Vader and the last thing said by Ferus but for the most part the book feels like more of a filler..a stepping stone to the next part. It is a good read though. Definitely worth the time and effort. The character guide at the beginning is excellent! It's a great addition to the series.Rosha's capital city is in flames and Ferus doesn't know if Trever is alive, nor the fates/statuses of his other friends - particularly those on the hidden base. He ends up going into Vader's quarters (as if the Sith wouldn't notice...and he doesn't..which is all sorts of OOC to me) and learns of a plan called Twilight. Additionally, his role as "facilitator" gains him hints and tidbits of work being done on Belassa that points to a large and secret technological project. He's on Belassa because Palpatine wants him to encourage his people to not resist the Empire. All that happens is that fewer trust Ferus.Something about Flame doesn't ring true to me, on many occasions.I love that Watson mentions that Solace is human and therefore has "dulled" senses in comparison to other species. As a youth though, Solace understood this and focused on enhancing those senses, particularly her hearing. It was interesting and realistic for a Jedi to do.Ferus' friends trust he is indeed acting as a double agent and band together to see what they can do to help him. The Empire is building some sort of secret weapon and the Eleven are trying to find out what it is. Ferus is finding his role as double agent even more difficult when he is being sent back to his home planet of Bellassa to overlook the activities, but he is really being used as a symbol to get the citizens of Bellassa demoralised. He is still unable to find out the true identity of Darth Vader and now he has to convince the Eleven that he is still on their side as well. And of course what he really wants to do, is find any Jedi in the Galaxy that managed to survive Order 66. Another excellent book in this series. It is hard to put down and luckily there is a character list, because the number of names can become confusing at times. In the final pages of the book Palpatine makes Ferus an offer that is quite dangerous, but offers him an opportunity to thwart Darth Vader's intimidations as well. It will be very interesting to find out in the next book what happens when Ferus accepts Palpatine's offer with the words: "I'm ready to learn". Holy goodness, what a story! This group of novellas follow Fenris Olin, a former Jedi Padawan who left shortly before the Clone Wars, and as such was sparred in Order 66. His rage at the Empire and pain at the loss of the Jedi who had raised and taught him for the first 18 years of his life fueled his rise as a rebel leader.Now int he 7th installment he's deep undercover and doesn't have any backup. His real goals known only two a few (we're talking less than 10 people in the galaxy) pretty much everyone thinks he's turned traitor.I had no clue where this book would lead, and what would happen. Each of these books get more and more unpredictable, and I had to just power through this book and devour every plot twist and turn. And where it leaves! I don't think I've read such a tricky situation so far in Jude Watson's Star Wars universe. I'm dying to get my hands on book 8 and find out how it's going to wrap up in just 3 more novellas!!! This book is even better than the last one. This series just keeps getting better and better. I recommend this book to everyone. Well, the story takes place on the planet Bellessa were the Empire is starting to build a weapon of somekind. Our hero Ferus Olin has to find out what that is and stop them from doing something devastating to Bellussa. This book has some very intense parts and I really enjoyed it. Watson has done it again. After the lull that was the previous two books in the series, "Secret Weapon" brings a lot of my suspicions to bear. 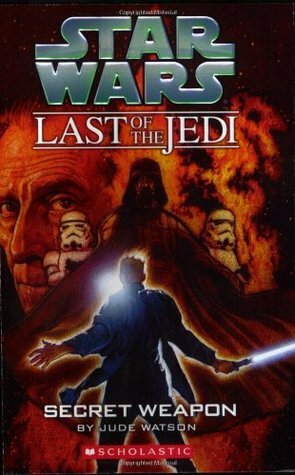 From the confrontation Ferus has with Vader (that played out in surprisingly realistic fashion), to the ultimate conniving of the Emperor that pulls back the layers of the Sith mindset, to the sudden and absolutely shocking death of a central character to the series, this book is the jolt of life the series has needed for the past couple of entries. Feris is continuing to be a double agent for the resistance. He is used as a puppet while visiting his home planet. His friends start to doubt his motives. A decent story that is a direct follow on to the previous book. A good read. Olin has found out that the empire is creating a secret weapon. and he must find out how to disable it before it hurts millions. This book should never happen, it's just wrong.